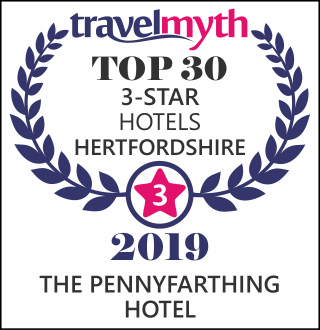 The Penny Farthing hotel in Berkhamsted is the perfect spot for your staying, whether you're joining us for business or leisure. Set in the heart of the Chiltern Hills it is an ideal location to explore the beautiful Hertfordshire countryside and surrounding area. The Penny Farthing benefits from good road links to both the M25 and M1 as well as the mainline train station just a short walk away connecting the town to central London in thirty-five minutes. Whether you're here for business or leisure, you're sure of a good night's sleep at The Penny Farthing Hotel. Not only thanks to our super-comfy beds in stylishly appointed rooms, but also because we're set back from Berkhamsted's high street. So you can drift off in peace, happy in the knowledge your car is tucked away in our private car park. As our guest, you can personalise your stay to suit. Hear the satisfying pop of the cork as you treat yourself to a bottle of wine with dinner at our sister pub, The King's Arms. Or if you're a fitness fan, our reception staff can arrange a free pass for you at local gym The Fitness Society. Just ask. Ground floor, no steps. Great porridge at breakfast. Comfortable and clean. Close to shops and restaurants. I've stayed at the Penny Farthing Hotel multiple times and have always been well taken care of. The breakfast is great with many choices from full English to cereal yogurt etc. The rooms have air conditioning which is very helpful in the summer and the beds are comfortable. Guests at the Penny Farthing Hotel are welcome to dine at out sister pub, just a short walk up the High Street here in Berkhamsted.